Self-build is very much in vogue now, as the government sees it as part of the solution to increasing housing supply. It also leads to higher quality, as owners have a vested interest in quality and performance. So perhaps it comes as little surprise that the vast majority (75 per cent) of UK self-builders are choosing timber frame construction over brick and block. So building with woods appears the way forwards. There are many good practical, as well as emotive reasons why this tried and tested building technique is still the preferred option for those looking to go their own way. Construction speed: It is estimated that a two-storey timber frame house can be constructed 30% faster than brick and block. Many contractors can erect and watertight your new home in as little as five days. That increased speed helps to avoids the disruptive effects of our changeable UK climate and decreases on-site labour cost. Savings: Most self-builders find that timber frame design and construction allow for more accurate budgeting across the entire project. The finished building will also be better insulated than the equivalent thickness of brick-block construction, resulting in lower energy bills. Thermal efficiency: Superior thermal efficiency means your building stays warm in the winter and cool in the summer. It is not by accident that colder countries such as Sweden and Scandinavia like building in timber. Increased accuracy and flexibility: Modern methods and off-site construction systems help to ensure that components fit together exactly as designed. Also, if there is a requirement for any unexpected alterations, then wood is generally easier to remodel without compromising its structural integrity. Environmental impact: It’s the low carbon way to build. Timber effectively captures massive amounts of CO2. 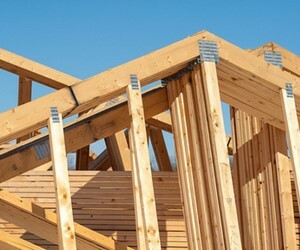 Wood for Good released figures showing that an average three-bed timber-framed house sequesters and stores roughly 19 tonnes of CO2. Add to that the ongoing lower energy costs and the timber option is kind to your conscience and your wallet. See more HERE. Health: The hygroscopic qualities of wood help regulate the moisture content in a house, which is an important aspect of providing a healthy environment. Hopefully this short list will inform and inspire your decision to build in timber. You’ll find more helpful information throughout this site and our partner site at Wood for Good.